This book is situated at the cross-roads of environmental, agricultural and economic history and climate science. 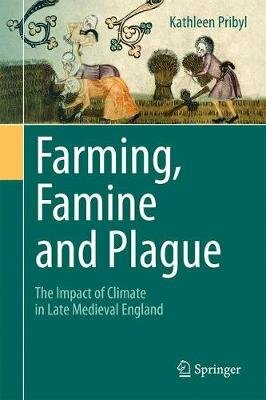 It investigates the climatic background for the two most significant risk factors for life in the crisis-prone England of the Later Middle Ages: subsistence crisis and plague. Based on documentary data from eastern England, the late medieval growing season temperature is reconstructed and the late summer precipitation of that period indexed. Using these data, and drawing together various other regional (proxy) data and a wide variety of contemporary documentary sources, the impact of climatic variability and extremes on agriculture, society and health are assessed. Vulnerability and resilience changed over time: before the population loss in the Great Pestilence in the mid-fourteenth century meteorological factors contributing to subsistence crises were the main threat to the English people, after the arrival of Yersinia pestis it was the weather conditions that faciliated the formation of recurrent major plague outbreaks. Agriculture and harvest success in late medieval England were inextricably linked to both short term weather extremes and longer term climatic fluctuations. In this respect the climatic transition period in the Late Middle Ages (c. 1250-1450) is particularly important since the broadly favourable conditions for grain cultivation during the Medieval Climate Optimum gave way to the Little Ice Age, when agriculture was faced with many more challenges; the fourteenth century in particular was marked by high levels of climatic variability.